It was only nine months ago that Forbes magazine named German Chancellor Angela Merkel the world's most powerful woman for the fourth year in a row. She impressed Germans and foreigners alike with her ascent to power — an East German pastor's daughter who took control of the male-dominated conservative party and won elections in Europe's economic powerhouse, becoming Germany's first female chancellor in 2005. She was lauded for hosting the world's top leaders at the G-8 summit in Heiligendamm in 2007 with ease and professionalism. She repaired relations with the United States that were strained over the Iraq war, and she positioned herself as a political heavyweight on the continent. It seemed that no major political and economic decision could be made in Europe without Merkel's approval. But over the last few months, the German chancellor's handling of Europe's economic crisis has made her widely disliked at home and increasingly isolated and even reviled abroad. On the international stage, Merkel, 55, has been criticized for dragging her feet for months over a bailout package for Greece and being too focused on German national interests. "For months, Mrs. Merkel resisted all appeals — by other European leaders and Washington — to, well, be a European leader," The New York Times wrote in an editorial Wednesday. On the same day, EU Commission president Jose Manuel Barroso criticized Germany for its role in the euro currency crisis and said it would be "naive" to believe that EU treaties could be changed according to German wishes without other nations wanting amendments as well. Barroso was referring to Germany's insistence that European Union treaties be changed to allow tougher sanctions for countries that have excessive government debt. In an interview with the German daily Frankfurter Allgemeine Zeitung, Barroso said "our union needs Germany in a leading role" and added he wants to see Germany "speak up for Europe. Otherwise, we have a problem." Concerned about German state elections in North Rhine-Westphalia in early May, Merkel had tried to postpone a decision on the Greek bailout until after the election. In the end, her European partners pushed her into supporting the rescue package just days before the election — which Merkel's party then lost. "This (behavior) shows a fatal German inclination for isolationism that one had thought belonged to the past," German daily Tagesspiegel wrote in an editorial Saturday. "This does not only make our partners suspicious of us, but is also completely senseless in today's globally connected world." Now, like her colleagues in Greece, Spain, Britain, Portugal and Italy, Merkel is struggling to prepare a worried populace for budget cuts. The chancellor has already scrapped plans for promised tax cuts, but still faces a huge federal budget deficit. Her government is going to decide on spending cuts and, possibly, even on tax hikes within the next 10 days. "For weeks, you've tried to sit on the fence and not get involved," opposition leader Frank-Walter Steinmeier of the left-leaning Social Democrats scolded Merkel during a parliament debate about the Greek rescue package. "You've let things slide and now that everything is ablaze, you're calling for the firefighters to solve the problem." Domestic critics have noted repeatedly that her new coalition has accomplished little in the seven months since it took control. 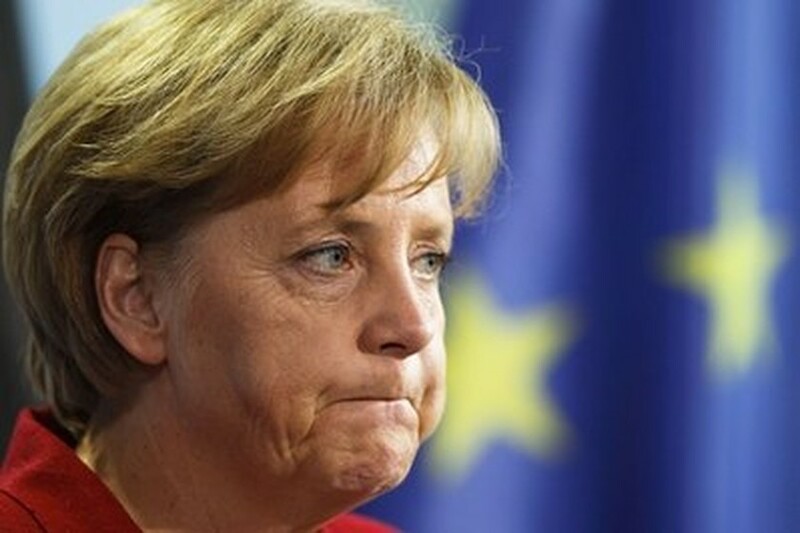 Her popularity among Germans has plummeted by 10 points to 48 percent — her worst showing since late 2006. Opposition lawmakers accuse the chancellor of lacking any vision or leadership when it comes to essential issues like an aging population, integrating immigrants into German society or tackling the question of whether to continue using nuclear energy. Merkel has not responded directly to the criticism and her office could not immediately be reached for comment Saturday. The chancellor's unilateral ban earlier this month on naked short-selling of eurozone government debt and shares of major financial companies received praise — but also criticism, because she made the decision without consulting the 15 other nations that share the euro currency with Germany. "Germany is still the most important economic power on the continent," Tagesspiegel wrote. "But while other powers used to look at Merkel for orientation ... today she seems to be confused and changing her position according to the influential powers around her." Of 1,000 people surveyed by Infratest dimap this week, 58 percent said they thought Merkel's previous coalition government of her conservatives and the center-left Social Democrats was better than the new coalition Merkel formed in October with the business-oriented Free Democrats. Only 34 percent said Merkel's government had made the right decisions to counter Europe's government debt crisis. "Merkel, the crisis-managing chancellor, has turned into a chancellor in crisis herself," the daily Welt newspaper wrote on Friday.